How Are You 'Spending' Your Summer? It's that wonderful time of the year for college/university students - exams are finished, classes have been passed (hopefully) - and now it's time to enjoy the summer. But the question begs to be asked - How are you going to 'spend' your summer? If you're lucky enough to already have a job, congratulations! It's still a tough grind out there. If you haven't found a job yet, keep plugging away and something will come along. If you are returning to school in September you will hopefully have a plan in place for the money you are going to earn. How much are you going to set aside for an emergency fund? What about some personal money to last throughout next school year? Are you going to be responsible for your own expenses? How much can you set aside if you are diligent and reduce the amount of student loans you will need? These are all questions you need to sit down and think about before you get too far into the summer. If you get your pay through direct deposit you should be able to ask your financial institution to automatically move your money into one or more designated accounts. This will help greatly in splitting up your funds and jump starting your savings plans. Create a separate account for each designated need - emergency, expenses, books, food, etc. The easier you make it for yourself, the more likely you will be to stick to the plan. Make sure you leave yourself a little wiggle room, though, so you can enjoy your time off this summer as well. It is, after all, your well-earned break from the hard work you did at school last year. Bottom line - make a plan NOW for how you are going to 'spend' your summer. You'll be much better off when September comes along if you take the time to put your money plan in place before you get wrapped up at the beach, or the cottage, or at work this summer. Cheers! Now that most post-secondary schools have finished their exams and students are back at home - I just wanted to congratulate those of you graduating in the Class of 2011. You have completed an important part of your life's journey. All the best in persuing the job of your dreams. It is my sincere hope that you accomplish all you desire in life and in your career. To those of you who are finished school but heading back again in the Fall for another year - keep your eyes on the prize. Save up as much as you can from those summer jobs. Figure out what you're going to do with last year's books (Hint - sell them on one of the multitude of websites designed for just such a purpose). Stay on top of your financial position throughout the summer so when you do head back to class in September, you are ready to face the financial challenges ahead. Have a great summer everyone. 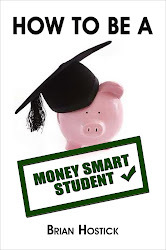 I'll still be here posting and updating and growing the Money Smart Students community - so keep checking back when you have a chance. Cheers!